I'm Just Sharing » Does Blogging Work For Business? Although I find blogging to be a popular subject for many people to talk about, there are still a lot of businesses trying to figure out not only if there’s any kind of return on investment in doing it, as well as whether they have the time or the inclination to do it. I have a story that might be illuminating. A few weeks ago I got an email out of the blue from someone wanting some consulting advice from another state. I sent her my phone number since it wasn’t included in her email (major lesson; always include all of your contact information in your business emails) and said she could call me the next day. She did just that, and we talked for about 10 minutes about the possibility of my doing some work for her, work that will pay nicely. I asked her how she’d heard of me. She said that a friend had sent her some kind of newsletter that included a link to a blog post I’d written and that it intrigued her because it looked like something she needed for her company. I asked her if she remembered which blog post it was and at the time she didn’t. She said that she’d find it and send it to me. When I got it I was surprised because it turned out to be a post I’d written almost 3 years ago. So, someone else liked my post, used it as inspiration in a post they wrote for a newsletter, put my link in it, someone else got it and liked it and forwarded it to a friend, that friend then liked it enough to call me. And I have a shot at getting business out of it. Sure, years later, but what did it really cost me when I wrote that post many years ago? I tend to write fast, so it might have taken me 5 to 10 minutes at the most to put it together, and it stayed on the blog for years, and now look at what’s happened. Even though I don’t get the contract, I had a shot at it. 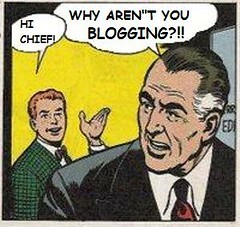 That’s the power of blogging; that’s why I talk about it all the time. You never know who might find your content and be impressed enough about it to contact you for business. Of course, now I have to address the question I’ve seen about whether every business should have a blog or not and whether it can work for everyone. That’s a question that’s hard to answer easily, although it’s an easy answer. My opinion; if you can blog and you can talk about your business, a blog will help more than it will hurt unless you stop writing on it. I tried to blog for my business site, The Write Design Company, and really didn’t have a lot of content about business writing since I write about writing on my personal writing site. Like you said, it can work for you if you have enough content to share. Otherwise, it’ll be a bust. P.S. Your high-paying assignment is on the way. LOL! Thanks Marcie! It can work with the right motivation and enough content, but having similar stuff… that’s why I shut down my other blog.